Pond Liner & Underlay We carry a full line of flexible 45 mil EPDM pond liner and installation products to create the perfect pond or water feature. From large commercial ponds to small water gardens you'll find the perfect installation and repair products here. We carry a full line of flexible 45 mil EPDM pond liner and installation products to create the perfect pond or water feature. From large commercial ponds to small water gardens you'll find the perfect installation and repair products here. First, you will need three pond dimensions- length, width and max depth. These measurements should be all be made in feet. You’ll then add the length to two times the depth plus 2. You use two times the depth because the liner needs to go down on both sides. The extra two feet is for overhang. This gives you one extra foot on each side. So, the liner needed for this pond is 18’ X 14’. More often you’ll need to round up or down since liners are cut in 5 ft. increments. The closest liner size, commonly available for the above dimensions, would be a 20’ x 25’ liner. Carlisle's fish-friendly AquaTough EPDM pond liners combine design flexibility, long-term durability and easy installation, making them an ideal choice for a variety of waterscape applications. Firestone & Carlisle's fish-friendly EPDM pond liners combine design flexibility, long-term durability and easy installation, making them an ideal choice for a variety of waterscape applications. Specially formulated to be fish and plant safe. 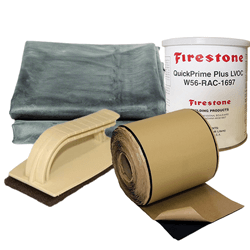 Firestone PondGard EPDM liner is the material of choice for various waterproof lining applications. Specially formulated to be fish and plant safe, they can easily be shaped to fit the unique contours of any size pond or complex landscape feature. Protect your liner from rocks, roots and other sharp objects with a fabric underlayment. Can also be used on top of liner to protect from punctures when adding gravel and stone inside the pond. Whether seaming or repairing liner you'll find all the necessary components here. Choose from seaming and repair tapes, patch kits, pipe-boots, etc. Multi-purpose coating that cures into a waterproof membrane. Available in a variety of colors. Seaming tapes are also available for seal joints and tears. 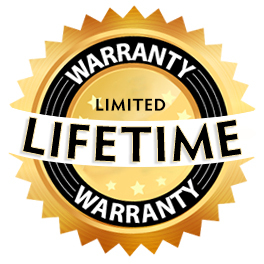 We carry the full line of flexible Firestone 45 mil Pond Liner and installation products to create the perfect koi pond or water feature. If you are looking for a rugged liner at a great price our site is the place to be. From large commercial ponds to small water gardens we have the right product for you. Protect your pond with a long lasting, fish safe and fish friendly Firestone Liner. Firestone is having availability issues. If the size you need is not available please consider Carlisle Aquatough 45 Mil Pond Liner. Firestone is having availability issues. If the size you need is not available please consider Carlisle AquaTough Pond Liner - 50 ft Rolls. Carlisle's 45 mil Fish-Friendly EPDM AquaTough Rubber Pond Liners combine design flexibility, long-term durability and easy installation, making them an ideal choice for a variety of waterscape applications. All of these liners will be shipped via Fedex Ground. A clean, easy, safe way to create larger panels to cover a greater surface area. Environmentally friendly, and creates strong seams.